Just out: the “accepted” version of the Rode et al. paper discussed here last month — detailing just how well polar bears in the Chukchi Sea subpopulation are doing, despite recent declines in sea ice. However, what was decidedly odd was how I found out about it. Yesterday (Aug 28), while looking for something else, I found a “press release” tweeted by World Wildlife Fund (WWF) employee Geoff York, who is now also a full voting member of the Polar Bear Specialist Group (PBSG). The announcement that York tweeted is listed as “alaska.fws.gov/external/newsroom/pdf/cs_polar_bear_article.pdf” and I found a stand-alone copy of the pdf with that title on Google. Not exactly how I’d choose to spread good news, but perhaps that’s the point. Nevertheless, not too much new in the paper itself [contact me if you’d like a copy] – no population size estimate, for example – other than what I included in the summary provided last month (based on a March presentation by lead author Karyn Rode), except this: spring litter sizes [1.90 in 2007 and 2.17 in 2009 on Wrangel Island] were “are among the highest reported for 18 of 19 polar bear populations” and were similar to litter sizes 20 years earlier. 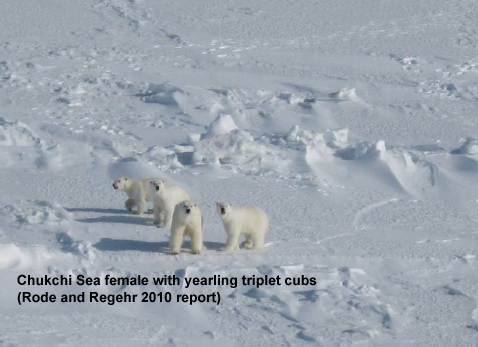 I guess the picture of the Chukchi female with a litter of triplet yearling cubs included without mention in the 2010 Rode and Regehr report (pdf here, copied below, discussed previously here) was significant after all. “The larger body mass of adult females in the CS corresponded not only with larger litter sizes, but also with heavier yearlings (Fig. 5) which have a greater chance of survival (Derocher and Stirling, 1996). Polar bears (Ursus maritimus) have experienced substantial changes in the seasonal availability of sea ice habitat in parts of their range, including the Beaufort, Chukchi, and Bering Seas. In this study, we compared the body size, condition, and recruitment of polar bears captured in the Chukchi-Bering Seas (CS) between two periods (1986-1994 and 2008-2011) when declines in sea ice habitat occurred. Additionally, we compared metrics for the CS population 2008-2011 with those of the adjacent southern Beaufort Sea (SB) population where loss in sea ice habitat has been associated with declines in body condition, size, recruitment, and survival. We evaluated how variation in body condition and recruitment were related to feeding ecology. Comparing habitat conditions between populations, there were twice as many reduced-ice days over continental shelf waters per year in 2008-2011 in the SB than the CS. CS polar bears were larger and in better condition, and appeared to have higher reproduction than SB bears. Although SB and CS bears had similar diets, twice as many bears were fasting in spring in the SB than the CS. Between 1986-1994 and 2008-2011, body size, condition, and recruitment indices in the CS were not reduced despite a 44-day increase in the number of reduced-ice days. Bears in the CS exhibited large body size, good body condition, and high indices of recruitment compared to most other populations measured to date. Higher biological productivity and prey availability in the CS relative to the SB, and a shorter recent history of reduced sea ice habitat, may explain the maintenance of condition and recruitment of CS bears. Geographic differences in the response of polar bears to climate change are relevant to range-wide forecasts for this and other ice-dependent species. This entry was posted in Advocacy, Conservation Status, Sea ice habitat and tagged Chukchi Sea, Davis Strait, FWS, Geoff York, good news for polar bears, litter size, PBSG, polar bear population density, Polar Bear Specialist Group, polar bears doing well, polar bears have not been harmed, press release, Regehr, Rode, twitter, US Fish & Wildlife, World Wildlife Fund, WWF. Bookmark the permalink.